Critical reflection is promoted by many Western social work writers as a process for facilitating practitioners’ capacity to reflect upon their complicity in dominant power relations. However, the Western social work literature tends to focus on those who are disadvantaged, oppressed and excluded. Those who are privileged in relation to gender, class, race and sexuality, etc. are often ignored. Given that the flipside of oppression and social exclusion is privilege, the lack of critical reflection on the privileged side of social divisions allows members of dominant groups to reinforce their dominance. This article interrogates the concept of privilege, as it is manifested in the West and examines how it is internalized in the psyches of members of dominant groups. Chinese readers are invited to consider how this concept may be relevant to social workers in China. 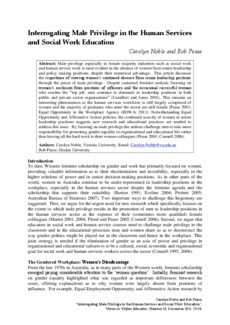 The article concludes by encouraging social work educators in both the West and the non-West, to engage in critical reflections about privilege when teaching social work students about social injustice and oppression.